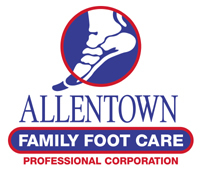 As the temperature drops, you may wonder, “Why are my joints so stiff?” At Allentown Family Foot Care, we are asked this question often as winter approaches. Temperature affects blood flow to and elasticity of soft tissues. This includes ligaments and tendons supporting your joints. If arthritis already exists, the decrease in elasticity of your body’s soft tissue speeds the process. Joints from your knees, ankles, feet and toes may feel like they are “frozen” and unable to move. When you are out in cold or windy conditions, remember to layer, layer, layer. Base layer clothing or socks made of synthetic fibers such as polypropylene or CoolMax® (a brand name for a series of moisture-wicking technical fabrics developed by DuPont Textiles) are best for wicking sweat and reducing friction. Adding a thicker layer of wool will keep you warm in the harsh winter conditions. Keeping your body warm in winter weather is vitally important to your comfort and health. Generally, cold feet can be avoided by utilizing a mix of old and new technologies along with a dose of common sense.